One look at this Bag of Skeleton Bones, and you will think you are looking at a skeleton body, all contained in one bag! This impressive bag contains 13 bones of various shape and size, ranging from skulls to hands to leg bones and more! 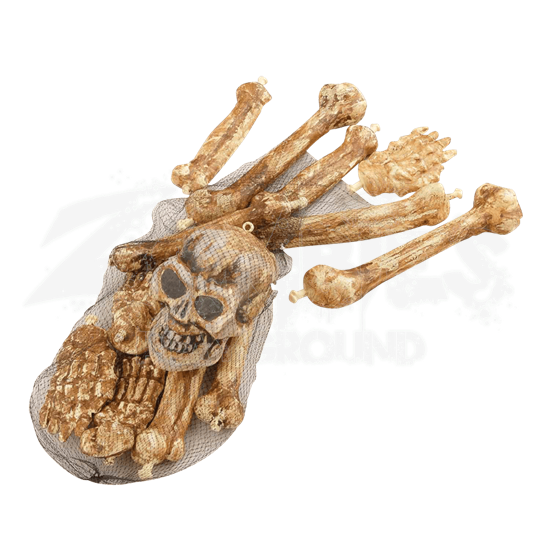 Each of the bones featured in this bag possesses an impressive appearance, including a brown and yellow decayed look that takes each featured bone and makes it that much more horror oriented. These bones make a fantastic finishing touch to any variety of Halloween or horror decors. Or, if you are looking for a really wicked idea, you can pick up this Bag of Skeleton Bones and spread them about your zombie scene, making it look like the zombies of have picked the bones clean before moving on to fresher prey.